31st May 1916. Harold Gore-Browne, G Social, 1899. Assistant Paymaster, HMS Invincible, Royal Navy. 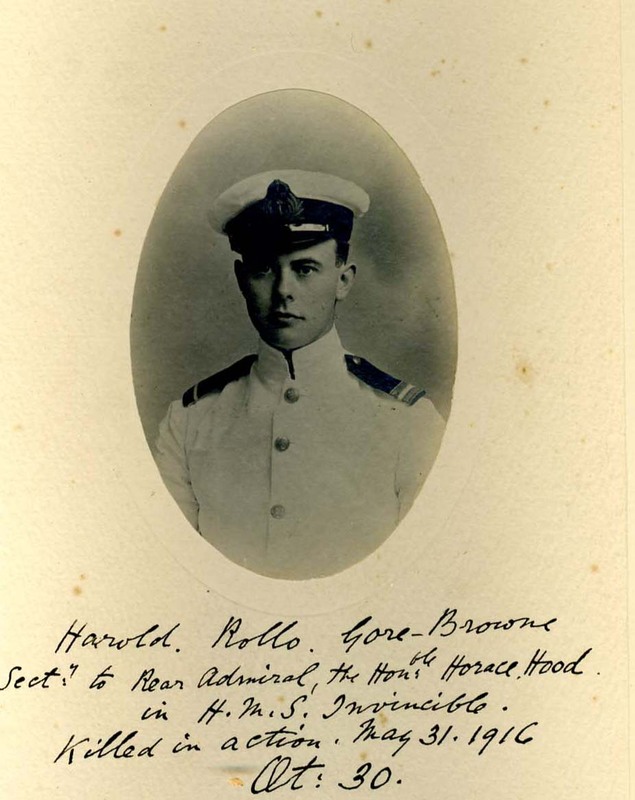 Died on HMS Invincible during the Battle of Jutland.Harold Gore-Browne was the grandson of the Bishop of Winchester. He joined the Navy pay corps immediately upon leaving school in 1904. At the time of the Battle of Jutland, he was serving as Secretary to Rear Admiral Horace Hood on his flagship, HMS Invincible. The vanguards of the battlefleets, made up of battlecruisers and smaller ships, collided just before 18.00. The German fleet, possessing better gunnery and range-finding equipment, had the better of the early exchanges. Hood’s squadron was heavily engaged, Invincible facing the combined batteries of SMS Lutzow and SMS Derfflinger. The combination of the two ships proved too tough for Hood’s flagship however, and a shell from Derfflinger penetrated the “Q” turret of Invincible. This resulted in a catastrophic explosion from the ship’s magazine, which blew the ship into two halves which sank separately. Of Invincible‍ ’​s 1,021 crew, there were just six survivors, pulled from the water by attendant destroyers. Hood and his staff were not amongst them. None of the bodies were recovered and they remain in the wreckage of HMS Invincible at the bottom of the North Sea. The wreck is now a protected War Grave. Posted in Commemorating the Fallen of WW1 and tagged Battle of Jutland, career serviceman, G Social, killed in action, Royal Navy on 31 May, 2016 by archives602.